Your reputation, conversion, and potential success fully depend on your customers. Are you interested in how to get high ranking on App Store? Read further for more detail. The fact is that most users pay no special attention to the design of your application. Sensible phone users understand that the cover has no value if the stuffing leaves much to be desired. The point is that you have to win the trust of the users and this will help your project develop and attract more people and encourage them to leave feedback. This is called conversion. Are you willing to know more? Keep on reading. Conversion Rate: What Is It? 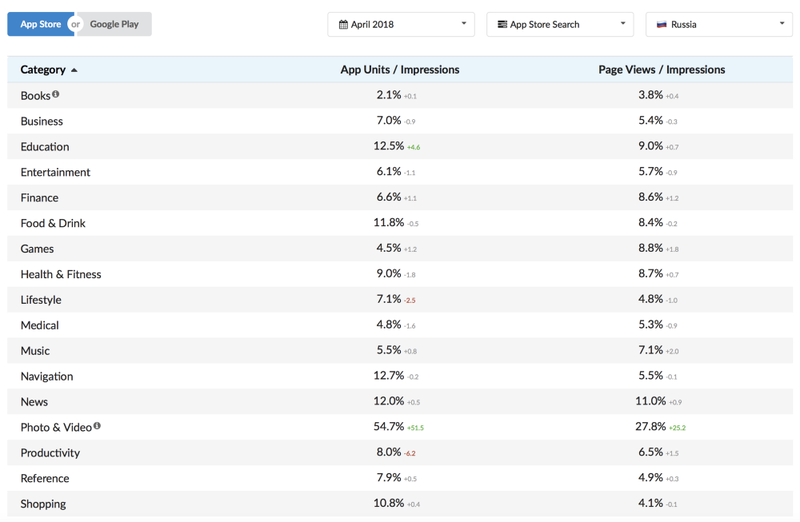 App Units/ Impressions. That’s a balance between the downloads and views in general. App Units/ Product Page Views. That’s a balance between the downloads and views on the main page of the product. Product Page Views/ Impressions. That’s a balance between the views on the product page and the views of the app in various charts and categories in general. The thing is that all conversion types can be observed in iTunes. Unfortunately, Google Play has only one type – the second one. That’s not much of a trouble. 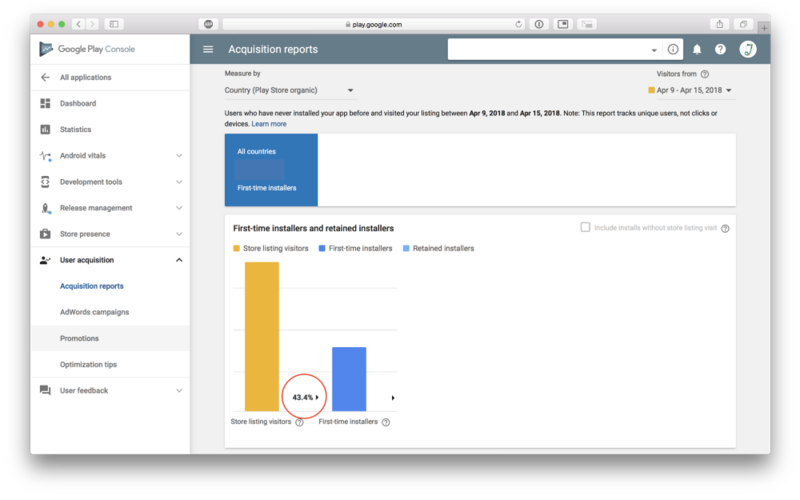 Both iTunes and Google Play have pages with analytics open to the public. Let’s see how it looks like. 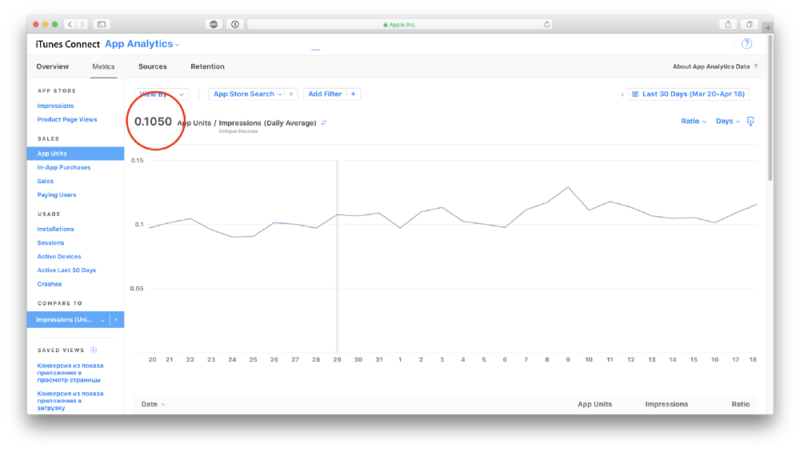 The first conversion type demonstrated in iTunes analytics. The second type of conversion demonstrated by Google Play analytics. Our next step is to understand if there’s something that can affect the statistics and if it’s actually important to follow its results for further improvement. The report was created in spring of 2018. 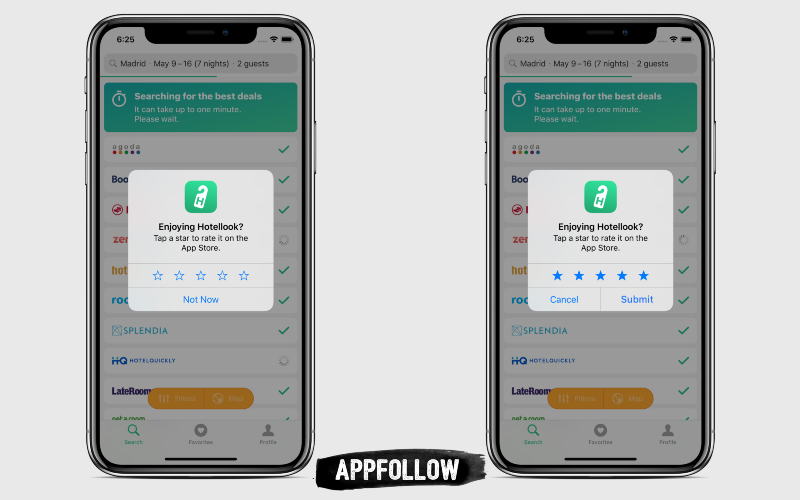 Seventy-nine percent of users have no wish to download this or that app before they study the feedback of other users and get informed about the general rating. Both iTunes and Google Play have ratings placed in the search results. The users have no necessity to visit the official page of the application to understand whether they’re satisfied with its rating or not. They see it on the spot. About forty percent of the users agree that they’re more interested in the opinion of real people. They don’t trust professionally made ratings. When people leave regular true-to-life positive reviews about the app, they prove that the application and the company are trustworthy. Now let’s discuss the minimal rating that can still be approved by the users. The following chart makes a nice visual depiction. If an application has less than three stars of rating, it is almost fully ignored. Three stars of rating make the users ignore you. It means, that you don’t need to make your mobile application better and add numerous new functions if you’re not on the list of rated apps. You certainly need to work on conversion and your reputation in the world of mobile applications no matter if you work on Android platform or iOS. You need to optimize an app with a proper title, corresponding keywords (to make it acceptable for the search engine) and description. The following option works only for iOS. There’s always a possibility to reset your rating in case if you’ve got a new version of the app. Unfortunately, it won’t do much for your overall rating, because, you’ll have to change something to attract more users to it. You’ll have to make a thorough investigation into the functionality of your app to understand what’s wrong with it before you can get satisfactory feedback. 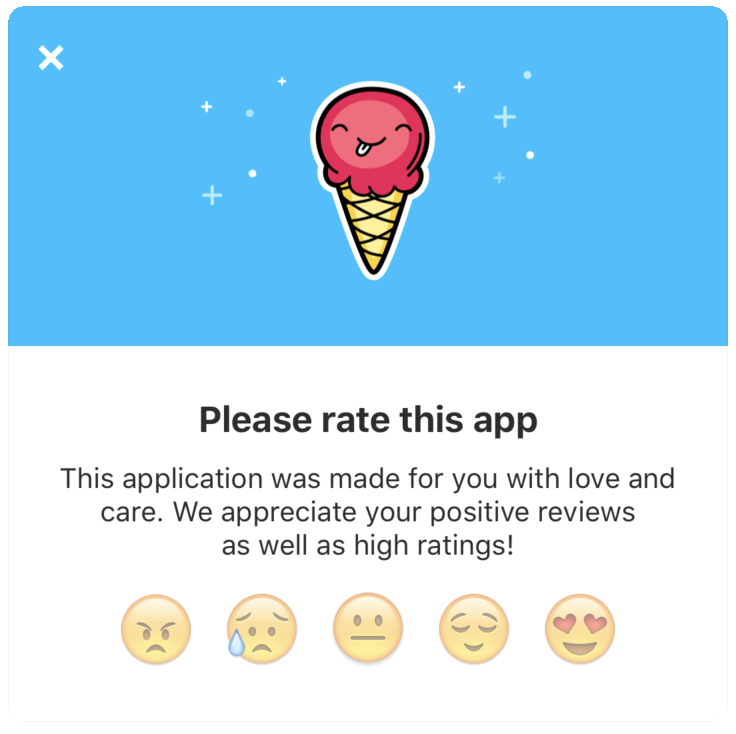 You’ll evidently have to deal with negative reviews to get more information about the drawbacks of your app. Study the complaints of the real users before you proceed with the renewal of the functionality. Unfortunately, there’s no chance to reset your ranking in Google Play. It means that every update you’re willing to release should be thoroughly tested before the official release – you won’t have a chance to get rid of the reviews left by the users for the previous versions of your app. First, you’ll have to get rid of the bugs. 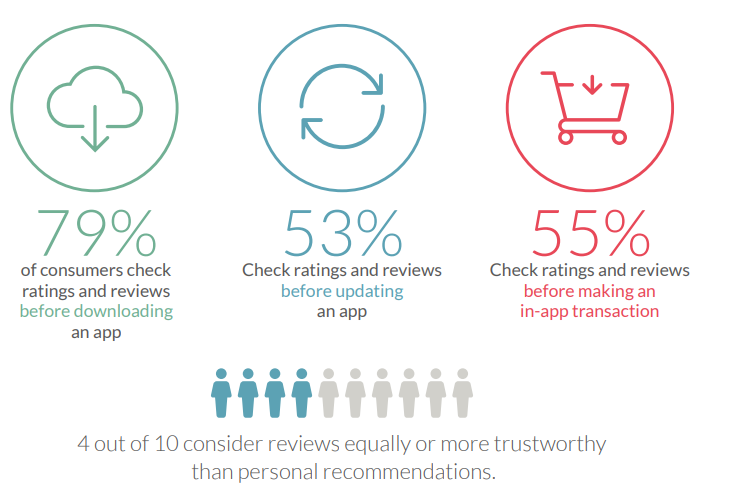 As soon as the app works the way it should to, you’ll experience a significant rating growth. The number of downloads will rise as well as your reputation. The trouble is that satisfied users almost never tend to leave a positive feedback about your application. Most of them are motivated by negative emotions that actually work more effective than the ones affected by euphoria and satisfaction. Your first aim is to find the right time for the notification about a feedback. The best moment to ask for it is right after the user completes this or that task in a game or an app. The user will be good to you if you won’t disappoint him or her with unpleasant malfunctions. Attention! The worst policy is trying to interrupt your user in the process of gaming or using any type of the application. As soon as he or she deals with the task, it’s high time to politely ask for the feedback. Try to use StoreKit framework to get reviews in App Store. This little tool will help you motivate your users without getting into your account. That’s a perfect hint for an owner of a small business who has no idea how to deal with the development of the business in the very beginning. The picture serves as an example. That’s how it works. Look at the rating statistics of Hotellook and study the following chart. iOS ratings bring less profit in comparison to the number of the reviews in the following year! The number of ratings became five times bigger. Integration of native rating request brings much profit. Starting from the beginning of summer, their conversion rating has grown up to fifteen percent. That’s an impression/App Unit conversion that makes people believe the app is worth downloading. Applications rated like this provoke more trust from the users. That’s the way to deal with your competitors. You’ll need to build in special features for the increase of your rating into your application to gently attract the attention of your users. Ask your user to leave a feedback after he or she deals with the task in the game or an app and gently notify to leave a review or a rating mark. It won’t be a trouble for a satisfied user to share his or her opinions with the public. The positive emojis led to the positive rate and a possibility to give a nice feedback in App Store. The negative emojis led to the possibility to give a full negative feedback on the website. The new rating system in App Store works in a different way. There’s no dialog with emojis. Moreover, the system of requests can easily be turned off in case if a user has no intention to share his or her impressions about the app with other users. You’ll have to opt for customized rating requests, but it still won’t be a guarantee of a stable feedback, because a user can reject even a customized review request. It’s easier with Android. In-app requests don’t work here at all. The only thing that makes users leave feedback is a customized option. Besides, Google will also warn you that notifying the users while they’re playing or using the application is not a good idea. Requests for reviews built in the application improve the ratings and ranking as well.